The study takes into account financing, operating, insuring and maintaining a vehicle during a year in which 15,000 miles are logged. According to Scot Hall, CEO of auto lease clearing house Swapalease, one can lease a 2013 Toyota Camry for $326 a month, making annual lease payments a total of $3,912. When estimated insurance costs of $1,029 and annual fuel costs projected at $2,167 are added in, the total costs for the same year are only $7,108. Given the prices paid for the 2013 Ford Fusion are pretty much the same, it would follow similar numbers would attend the purchase of this popular sedan as well. Notably, insurance is a highly subjective factor to the purchaser, but with $2,000 in leeway, it would seem most anyone would save money on a lease these days. Then there’s the advantage of the reliability of a newer car, lesser repair costs and the fact that some leases cover regular maintenance. According to the AAA study, one of the causes of the cost of owning and operating a car going up roughly two percent since last year is an increasing outlay for maintenance, up 11.26 percent. A person with a lease, however, is only concerned with the first three years of a vehicle's life, when the maintenance costs are at the least in the auto’s lifespan. An owner has to contend with rising maintenance costs as the car ages past that point. Insurance costs have risen as well but only by 2.76 percent. Other factors such as fuel prices and tires are up slightly or unchanged, but depreciation has increased by only .78 percent – that’s what the lessee pays for – the value lost by the automobile over the three year span of the lease. In most lease agreements it is possible to get out or transfer the remainder of the lease program to another person, providing the reason for the existence of Swapalease. Generally speaking, to get out of a lease by selling a car to an individual or trading it in at a dealership, the lessee will encounter negative equity – similar to a house under water. Could the least expensive means of keeping a late model vehicle come from taking over the last year of someone else’s 3-year lease on an annual basis? It’s an interesting conjecture that might turn into another post at a later date. Swapalease gets most of its business from company cars and employee transfers. They go to great lengths to assure everything they do fulfills the procedural requirements of the lease and related legalities. “We don’t want to put anyone in jeopardy,” Hall affirmed. Most though not all leases are transferable, so if anyone is considering using this service to move up to a new model every year and a half or two years, it’s a good idea to make sure you have a way out before signing the lease. Virtually any car can be leased, including plug-ins, electrics and CNG vehicles. In fact, we talked to a local dealer who told us you could lease a new Mitsubishi MiEV for two years with a total payment and fueling cost of $2500. All you add is insurance to a car costing $30K with no option of used parts, because they haven’t been around that long. On the other hand, EV’s have fewer parts to worry about. 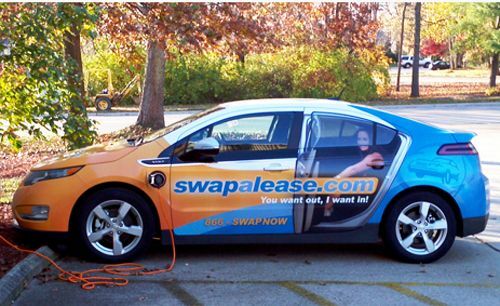 “We have a Chevy Volt for the Swapalease company car,” Hall said, “that turns a lot of heads because we have it wrapped in a Swapalease advertisement. It gets great fuel economy and it’s a car I really like,” he concluded. For the record, the Swapalease site has tutorials for both those who want to get out of a lease, those looking for a shorter-term lease and plenty of information, including FAQs and testimonials, for lessees on either side of the equation. AAA has been providing cost of owning a car reports for 64 years and now is one of the foremost authorities on the actual costs of driving any particular model over five years. The numbers don't add up. I'm sad to say this article is a shameless plug for swapalease. I love torque news, in fact I read it daily, but this article is less of a review and more of an ad than anything else. Lets say the purchase price for the car in question is 35k. Over a three year period the leasee will pay 21k ($326 a month was the payment, notice there was no mention of down payment or damage coverage or other fees in the article). Let's say the owner decides to pay $326 a month to be comparable. Over 3 years an owner would have paid $11,736 towards the vehicle and would have driven 45,000 or fewer KM (to be comparable with the lease). After three years the leasee returns the vehicle and has nothing to show for it and no problems. The owner still owes approximately $23k (again because we decided to do the exact same payment which is usually not the case for financing). A quick search of autotrader sees 3 year old camry's with an average of 30-50K selling between $14500-20500. Arguably our camry with fewer than 45xxx should sell in the $18k range. Subtract that from our $23k owing on the vehicle and we have $5k, divided over 3 years is $1600 and that is paying the EXACT same payment as the lease NOT $2K more annually. The numbers don't seem to make sense. Most warranty's last up to 5 years or 100,000 KM so keeping a car another 1-2 years won't see extreme increases in maintenance, especially if you preform regular maintenance. Not to mention in the event that the owner drives the car 17k in a year there is $0 increase in cost...unlike the leasee who will have completely burned through any savings they might have thought they were getting. Imagine the owner did decide to increase monthly payments to make up the annual 2k difference then by keeping the car another 2 years the owner would be the one with a smile on their face owing nothing on the car, at which point insurance could be changed to further reduce cost. Not saying there isn't a benefit, or market, for leasing but I just think this article is a bit one sided and doesn't make an effort to compare leasing to owning as much as it should. Thanks for your input However, we think you may have misinterpreted something. The AAA study is looking at the cost of owning and operating a new car for one year, though some of the data they use is averaged over five years – cost of maintenance, for example. The numbers provided for leasing were from Swapalease based on their proprietary database of lease specifications. Swapalease does not lease new cars, they provide a connection between those who want to get out of a lease and others interested in a short term lease. The point of the article is that you may be able to to lease certain models for less over one to three years than it will cost to buy and resell that vehicle in one to three years. If you plan to keep a car for five to ten years there is no advantage to leasing.